Some anxiety is good for us. It motivates us to do things that need doing. However, many people don’t realize that it is not disease that kills us but the anxiety disorder that causes the disease that does us in. If your anxiety is abnormally high it is to your best interest to treat anxiety disorder so you can live a happy and joyful life. 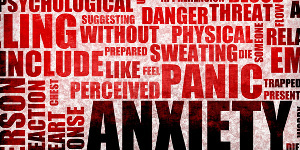 Anxiety disorder can lower the immune system and make us susceptible to many diseases. It is all related to the intensity and or the duration of the anxiety. 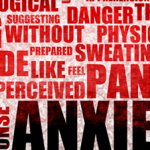 If some or all of these symptoms apply to you, you may be suffering from excessive anxiety. When people suffer from too much anxiety, they produce too much adrenalin. This substance bathes the body in a harmful chemical that can debilitate body function and injure organs. Adrenalin also eats up Serotonin that is the substance produced by the brain that enables us to experience, remember and expect pleasure. Without it, we feel depressed and anxious. When people self-medicate, it actually makes them feel worse–more anxiety and depression and poorer sleep–but they think the substances make them feel better because the relaxed feelings come before the negative effects of the chemicals they take in. So, what makes the difference between normal and abnormal anxiety? Anxiety produces a flight or fight response. In animals, this occurs when the animal senses danger. The animal responds, takes a flight or fight response, and the anxiety dissipates. In humans, when the anxiety is persistent, the harmful chemicals continue to bathe the body harmfully and symptoms, including illnesses, result. This is why people have ulcers and animals don’t. When people come to see me with any of the above symptoms, sometimes they already know that they feel anxious and sometimes they don’t. The first thing that we do is to determine if the anxiety is related to a realistic cause or not. If it is realistic, we work to find solutions so that the person can move on. Examples of such anxiety relate to serious illness, relationship problems, and worries that are real about work. If the anxiety is more pervasive and not grounded in something real, I work with a mindfulness approach to help individuals change how they think and what they tell themselves. This is very effective. Meditation is also effective with anxiety and sometimes, a bit of medication. However, it is important to understand that medication will not solve the problem by itself. It only makes the work in a therapy setting more effective because it helps the individual find enough control to follow through with what the therapy is suggesting. It is also important to understand that often what produces anxiety is related to a past event. The event passes but the feelings do not. This is a form of PTSD-Post-Traumatic Stress Disorder. It doesn’t only exist for soldiers, but in our lives as well even if we are not soldiers. Part of dealing with anxiety is to understand where the feelings come from and whether the danger is still present. In therapy, I also work with people to disconnect the PTSD where it exists. The goals are related to symptom reduction or elimination. It needs also to be remembered, that anxious parents raise anxious kids. When I see anxious parents, I also work with the parents to understand what they fear and to help them feel more relaxed as they establish good boundaries and appropriate protection for their children.